I'm not a gambling girl, but I'm tempted to place a little bet on the outcome of the women's hockey competitions at the Beijing Olympics. I'm pretty sure that the British ladies have a good chance of taking home the gold. Why? Because of the picture above. 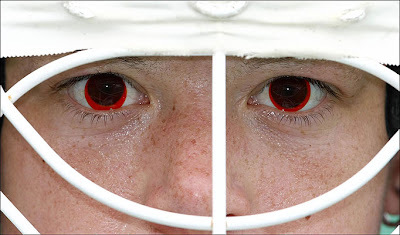 It seems the British women's hockey team has been outfitted with special blood-red contact lenses for the games. Officially, they're meant to help players see through the haze and smog that smother Beijing. But I can't imagine anything that would freak me out more than to see a bunch of ladies with blazing red eyes and big sticks coming at me. And I'm willing to bet that the world's hockey players feel the same way. That'd probably work. Then again, anyone coming at me with a big stick would scare me. Heck, maybe they've all been turned into vampires. Gah! Newborns at the olympics! haha. that would make me run the opposite way. ooh, thier contacts are like an eclipse. speaking of eclipses, there will be a total solar eclipse in other parts of the world uh.. today? (aug. 1 in China?) i think they have a live webcast. haha. that will make me run the other way. ooh, their eyes are like an eclipse. speaking of eclipses, there wil be a total solar eclipse uh.. today? (aug. 1 in China?) i think they will have a live webcast of it. Sorry I havent commented in a while, I've been really busy. Those are totally awesome. Maybe I could convince my mom into letting me have a pair when I get contacts. that is pretty darn freaky. Did you hear about the huge masses of players that refused to participate in the Olympics because of all the smog... That oughta teach Bejing to change their non-environmentally-friendly ways! Hockey Player:"Yeah, it helps us see through the smog." Me:"Argh! My eyes! I can't get this contact in my eye..."
And does anyone know what the URL space is for? Is it for if I have a website I can put the URL there? Wow that is so freaky. They're definitely gonna win. I agree with dangerous - vampires! Because someone realised what a lot of people would be buzzing about around then and decided to play a joke or something... Oh, wait, that wouldn't be red eyes, it'd be yellow-ish. wow. creeepy!!! yeah, some famous athletes won't go, i heard the world record holder for the marathon, from ethiopia, isn't coming to protect his health. that is funny....but that would make their eyes black, wouldn't it? Aargh, all you guy's comments are reminding me of the Twilight series! A little to romantic-y to be a Kiki Strike worthy book, though. "Aargh, all you guy's comments are reminding me of the Twilight series!" Don't worry, Hazel. I missed the live webcast of NASA for... I'm not even sure how many HOURS. I guess I should have checked the time difference. I stayed really late at night and woke up really early. Hmm... do you think it occured during the 3 hours I slept? SWEET!!! For whatever reason, my eyes seem to be ultra reflective. They turn red in pictured ALL THE TIME and they have flashed red outside of pictures before to. Flashes make my eyes light up red, and other weird lighting. Strange, huh?